I mentioned upon my return from my holidays that I had borrowed a couple of books from my mom. Well, this is one of them, and frankly the more exciting of the two. I’ve borrowed it at least once before, and it’s really quite awesome. To begin with, there’s the title. For some reason, it speaks to me. She is confessing her clean little secret, and really, she’s proud of it. I guess part of me really wants to be an organized housewife, just like her. – pep talks that work. Really. 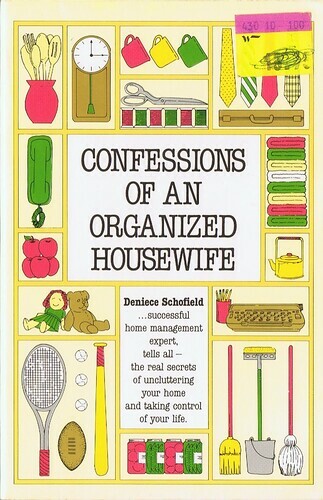 After reading this book I often come away actually excited about cleaning and organizing my house. She points out that by working on improving your technique, you raise houswork out of the mundane into a craft. She also discusses the benefits of having a clean and orderly house, including the feelings of peace and enjoyment of the home. To me, this is a frugal thought: if we like being at home, we will be less driven to leave it for expensive alternatives. – six “Basic Organizing Principles” including: Think Before You Act, wherein you stop working by habit and instead think through all the steps of a project or day or organization of a room, looking for the most logical time-saving way to approach it; Discard and Sort, wherein you de-clutter each area of your home so that there is “a place for everything and everything in its place” and everything you have on hand is useful and used; Group, which is pretty self-explanatory, except that she often groups by use instead of by type so that you might keep all your baking spices with your baking stuff and all your savoury spices near the stove if that’s where you use them, instead of keeping all your spices together; Be Motion Minded, considering how you move in a room, and saving time by putting things close at hand; Use Your Accrued Benefits, wherein you learn that it makes more sense to iron 6 shirts at a time, than to iron one shirt at a time six times; Do it Daily, so that things don’t get out of hand; and finally, become an “Indoor Scout“, leaving a room better than you found it each time. – advice for building your own planner that will accomodate your and your family’s needs. – efficient ways of moving through the house methodically so that you’re not re-tracing your steps or wasting time. The coolest idea here is her housework cart that she uses, like a hotel chambermaid. 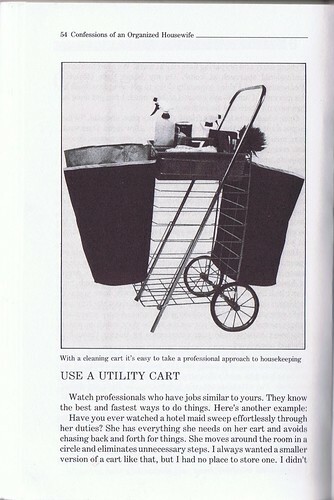 It’s totally collapsable and handles garbage, laundry, sorting of “stuff”, and cleaning all in one amazing little buggy! Seriously, I’m building me one of these. There’s lots of other tips here, many of which involve using labelled containers to sort stuff in cupboards, etc., but you should really read the book if you want to get into that much detail. – I am able to keep the house picked up; check, for the most part. – I am able to keep the laundry current; check. Well, I’m doing pretty good on 5 out of 6, so maybe the entry way is a good place to start. In any case, I’m very reassured that I am winning at 5 of these basics. Her recipe for starting a new level of cleanliness is to give yourself and your family six weeks to get used to it. So, starting today I will aim to keep my entry area clean and tidy, thus basically completing all six of her basics, and preparing to enter a new level of household organization. That is, until Tiny Baby arrives. After that, I make no promises. I came across this book by doing a random search for “frugal” on Google. It’s written in 1841 by an American woman who dedicates the book to “Those who are not afraid of economy”. Well, that’s me! Only 170 years later . . . I found it as a full-text book on Google Books. For those not familiar with Google Books, it is a search tool for books, old and new, in copyright and out. You can search words, phrases, etc. Most newer books will show your search phrase in context, but you won’t be able to read beyond that. Still others will allow you to read a limited number of pages. But a few of your results will give you the option to read the whole text of the book. Even easier than the library! You can download a PDF to read at your leisure, or add it to “my library” which is saved in your Google account. That is how I found The American Frugal Houswife. The book is written as a series of tips, or instructions, for running a household economically. It’s a bit ADD to read, with tips running from keeping up with mending once a week, to always keeping meats “under brine”–and that’s just on one page! You can imagine, it would be more than a little antiquated. It knocks me out to hear her tips on using an Ox’s gall to set the colours of calico, and using “rotten-stone and rum” to clean brass “andirons”. I have no idea what these things are! There are also several hints which involve using quicksilver, “black lead” and turpentine, which we now know lead a slow but sure path to death’s door. She also reminds readers not to over-spend with the desire to get into better company, and not to “let the beauty of this thing and the cheapness of that tempt you to buy unnecessary articles” when furnishing a home. Take that, Ikea! I’m still making my way through the thing, and it is a truly amusing and instructive read. How could Mrs. Child imagine that her book would end up being read on a crazy picture-tube 170 years in the future! Next on my reading list is another bestseller by the same author, this one entitled “Hobomok” . . .
I’m reading a very frugal-minded book right now, called “A New Earth,” by Eckhart Tolle. It’s not ostensibly about frugality but it contains several frugal messages. One is that consumerism–buying things for the sake of competition or boredom or to make yourself feel good–is an action of the ego, just as all mindless and evil actions and thoughts are. People believe that they will be perceived as being better for owning some new thing, but the satisfaction gained from purchasing something new is short-lived and soon the ego want something else, and something else, and something else, to fuel its quest for “more”. Another frugal message is regarding the roles we play. One danger we have as a parent is that we will fall into a habit of constantly “doing”–“acting” in our role as parent–and never relaxing into simply “being” there with our children, as people, respecting them as individuals. The advice is to practice “being rather than doing”. Simply relaxing, not always thinking about the “next thing” that has to be done, can be healing to both parent and child, as it allows them to exist as they are without playing roles for a short time. “Being” rather than “doing” will let the child feel valued as they are, and let the parent experience the child as she is without pressures or agendas. I was glad to be reminded of this, because I often get so caught up with “doing”–getting the groceries, making dinner, washing the laundry, cleaning the bathroom, etc. through the never-ending chore list–that some days I forget to share those relaxed times just playing with my girl. Heck, I even forget to give those relaxed moments to myself, always feeling the need to be “doing, doing, doing” . . . and I know exactly where it came from in my upbringing. My husband, on the other hand, has a much easier time sitting down and reading a comic book in the middle of a busy day. Does this drive me absolutely insane sometimes? Yes! But I can also see that he will be much more capable of, and just playing with our daughter without feeling the pressure of “we have to get to the park”. My hope is that he is passing this on to our daughter, so she will hopefully be able to relax and just be herself and not let the dirty floor or smelly cat litter make her anxious. And where does the frugality come in here? I know that there are days that I feel compelled to go to the grocery store because we “need” something, without stopping to think that perhaps we don’t really “need” it until tomorrow. Or ever! Maybe we don’t really “need” it at all; it’s just that it was on the agenda as the next thing to “do”. The urge to shop often comes out of this urgency of “doing” something. I feel I must start some new project, and the next thing that follows is the urgency of buying a bunch of supplies to start doing it. Once it goes onto my mental list, it’s there nagging me until it’s checked off. Practicing “being” can help me relax and enjoy the moment without needing to schedule new unnecessary projects or shopping trips. So, the message of the day is: relax, don’t worry about the next item on the agenda, enjoy life, and really cherish each moment of simply “Being” with her.